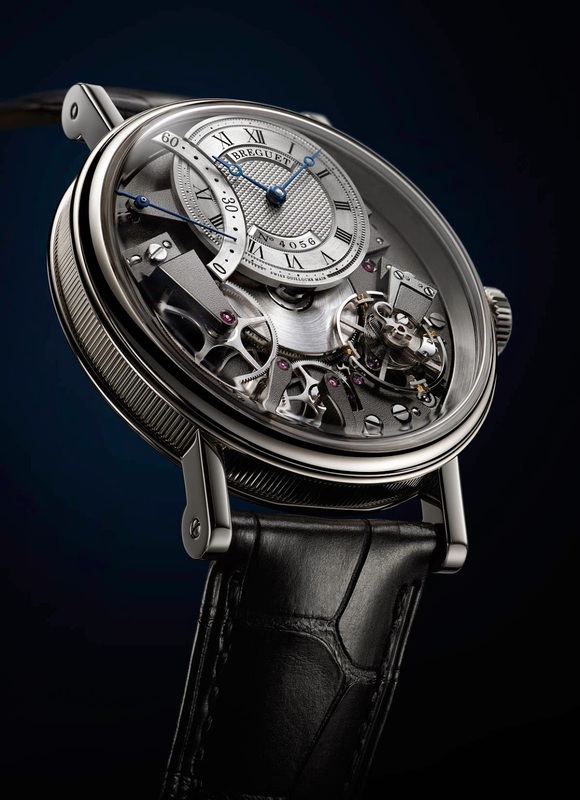 The Breguet's Tradition collection was first launched in 2005 with the 7027 model introducing the distinctive characteristic of showcasing the mechanisms of the movement on top of the baseplate. 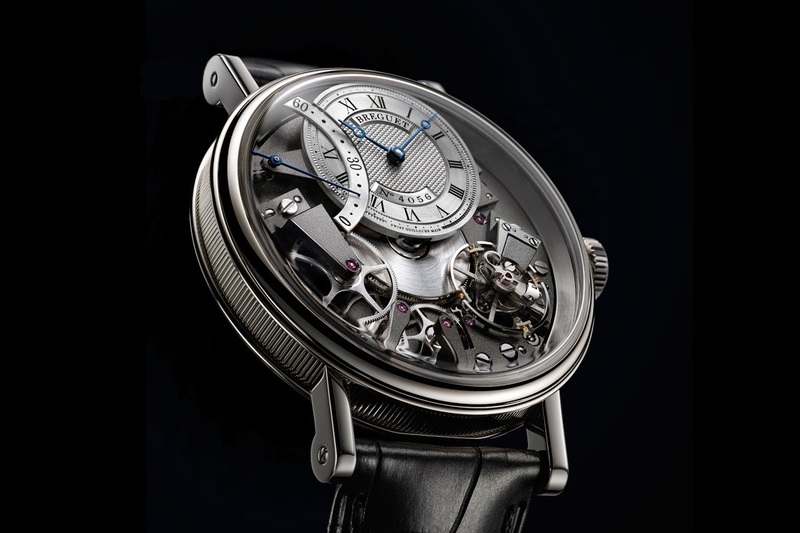 The architecture of the movement was inspired to the simple movements used by Abraham-Louis Breguet for his “subscription watches” whose production began in 1796 (so called because they were sold by subscription: a down payment of a quarter of the price on order and the balance on delivery). Similar movements were also used for another Breguet's invention: tact watches. These pocket watches were featured with a mechanism that enabled the wearer to tell the time by touch alone thanks to a pointer on the outside of the case echoing the position of the hour hand of the watch. Breguet is now presenting a new model that will enrich the Tradition line: the Tradition Automatique Seconde Rétrograde 7097, a BaselWorld 2015 preview. The hours and minutes dial - made in silvered gold, decorated with an engine-turned hobnail pattern and completed by open-tipped hands in blued steel and individual numbering - is offset at 12 o'clock leaving space to bridges, wheels, escapement, barrel and other components of the movement, all of them fully unveiled in their fascinating beauty. The bridges and baseplate are peened using a techniques which requires great mastery and full control to achieve a regular and uniform finish. The retrograde seconds indication, giving the name to the watch, is positioned at 10 o'clock, visually counterbalanced by the the pare-chute at 4 o'clock. This Breguet invention, somehow the forebear of all the shock-protection devices in use today, protects the balance staff from shocks. The 3Hz (21,600 vph) movement features an inverted in-line lever escapement with silicon pallets and a silicon Breguet overcoil balance spring that ensure exceptional stability of rate. The power reserve is 50 hours. 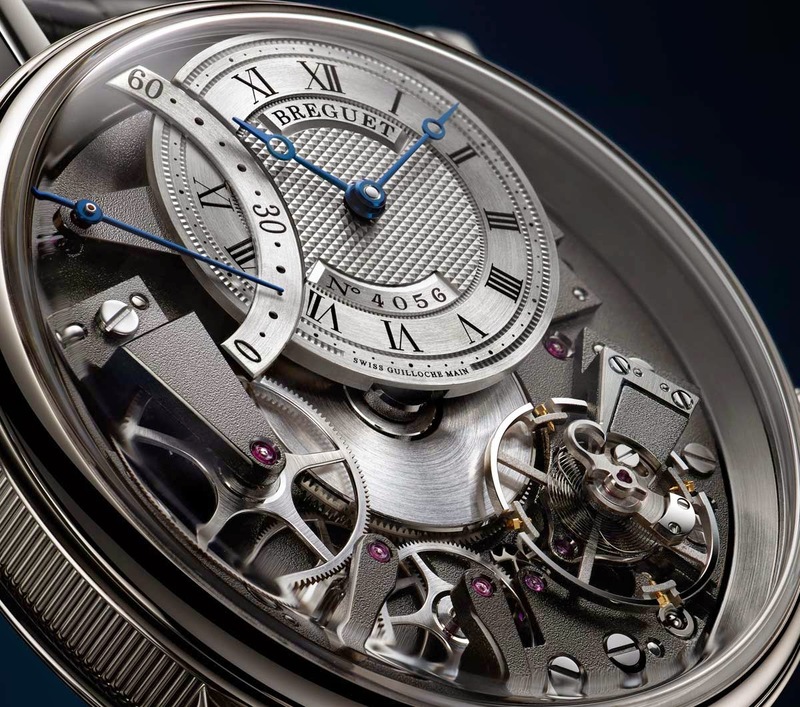 Baselworld 2015: Breguet Tradition Automatique Seconde Rétrograde 7097. 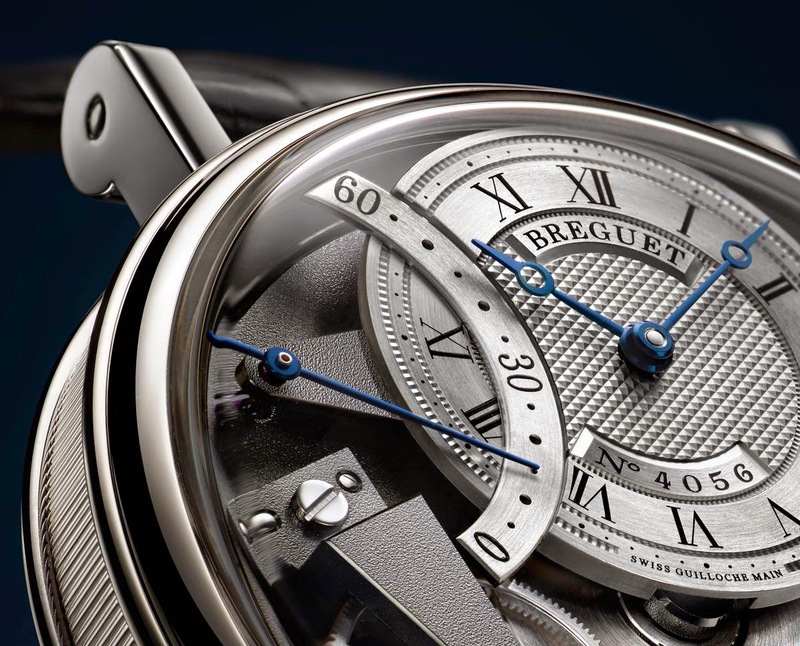 The Breguet's Tradition collection was first launched in 2005 with the 7027 model. Breguet is now presenting a new model that will enrich the Tradition line: the Tradition Automatique Seconde Rétrograde 7097, a BaselWorld 2015 preview. 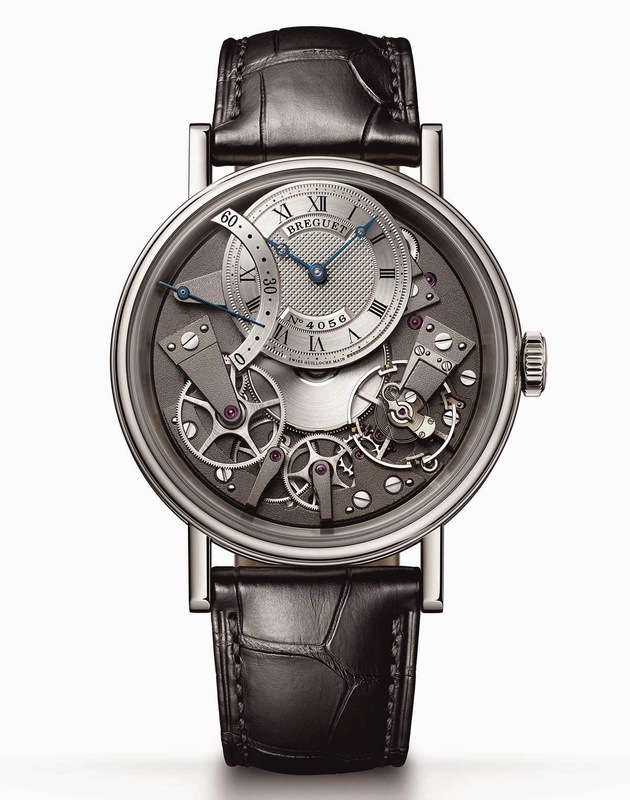 The Breguet Tradition Automatique Seconde Rétrograde 7097 is available in white gold (ref. 7097BB/G1/9WU) and in rose gold (ref. 7097BR/G1/9WU).